Maureen Hudson Nampijinpa was born circa 1959 at Mt Allen, near Yuendumu in the Northern Territory and is part of the Warlpiri Tribe. She began painting in 1981. Maureen’s Dreamings include Bush Onion, Women’s Ceremonies, Flying Ant, Fire, Water and Possum. Maureen’s father had two wives, Rosie and Lena who were sisters. Rosie had two children, Allan Norman and Jean Nampajinpa. Lena had four children, Maureen, Micha, Emily and Judith. Maureen’s father passed away in 1972 when Maureen was 12 years old. Her mother went on to re-marry Peter Brown Jungala and had another five children. 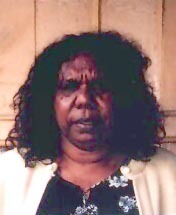 Maureen was educated at Yuendumu Settlement and later returned to Mt. Allen and worked as a teacher’s aid for three years. Maureen now has four children of her own, Michael, Jillian, Gwenda and Anderson Turner. Maureen was encouraged to pursue a full time career as an artist. The demand for her artwork has steadily increased over the years. Selected Exhibitions: 1992 "Central Australian Art", Art Dock in Noumea; 1992 Sand Paintings of the Central Desert, Centre for Aboriginal Art, Alice Springs; 1993 "Commitments" Museum of Modern Art, Brisbane, Queensland; 1994 "Dreamings" Tribal Art Gallery, Melborne (this was a joint exhibition with Cliffrd Possum’s painting). 1994 Gallery, Mt Atkin, Victoria; 1995 "Dreamings of the Desert", Gallery, Uluru, Northern Territory; 1997 "Desert Dreams" National Aboriginal Culture Institute, Adelaide; 1997 "Women Dreaming" Gallery 47 London UK "Songlines" Boulder, Colorado USA. Collections: Tribal Art gallery, Melbourne; Museum of Modern Art, Brisbane; Alice Springs Galleries and private collections.